Maxstar 150 S 230V Stick Welder by Miller Electric Mfg Co at In The National Interest. SKU: 907134. MPN: MIL907134. Hurry! Limited time offer. Offer valid only while supplies last. MIL907134 Features: -MAXSTAR 150 S - Best-of-class - provides maximum portability and performance in most compact Stick package in the industry. MIL907134 Features: -MAXSTAR 150 S - Best-of-class - provides maximum portability and performance in most compact Stick package in the industry. Packs dependability and performance all in one machine.. -UNSPC CODE: 23271400. -MAXSTAR 150 S STICK ONLY 120. 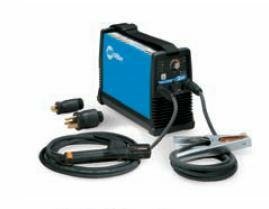 Product Type: -Tig welders. Product Type: -Stick welders. Duty Cycle Percentage: -30%. Duty Cycle Percentage: -100%. Maximum Voltage: -230 Volts. Generic Specifications: -230VAC. -Portable in the shop or at the job site - at 13.2 lb the shoulder strap allows the operator to easily move from location to location. Auto-Line technology circuitry automatically connects to 115 - 230 VAC, single-phase power without removing the cover to relink the power source. Low OCV Stick reducs open-circuit voltage (OCV) to 12 - 16VDC when machine is not in use. Adaptive Hot Start automatically increases output amperage at the start of a weld should the start require it and prevents the electrode from sticking and creating an inclusion. Single Amperage Range allows operator to accurately set amperage on both 115 V or 230 V primary power.. -Auto-Line Automatically ''''links'''' the machine to a broad range of primary single- and three-phase, 50 and 60 Hz input voltages without manually linking. Also compensates for voltage spikes and drops within the entire range. Delivering consistent output - All done without removing the covers to relink..
Get maximum portability and performance in the most compact Stick package in the industry. If you have any questions about this product by Miller Electric Mfg Co, contact us by completing and submitting the form below. If you are looking for a specif part number, please include it with your message.